How Important are Doors in Cinema Design? "How Important are Doors in Home Cinema Design?" An example: Your client has requested that his new home theater not disturb the rest of the household during viewing. The walls to the theater are designed to achieve an impressive Sound Transmission Class (STC) performance rating of 65. The entrance door to the theater is solid oak with full perimeter gasketing. Everything should be great, but it isn't...you've got a problem, a BIG PROBLEM. Your client can hear every word coming from the cinema while he's in the study a couple of doors down the hall. What happened? Many things can determine the overall performance of a theater, and doors are a common problem. Many people think that by increasing the wall's performance, it will overcome any inadequacy of the door. Not true. 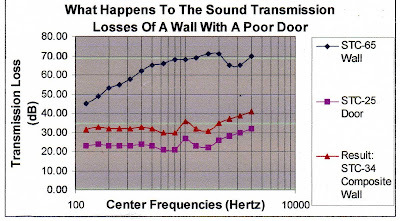 In fact, you could continue to increase the wall's STC performance far beyond its acoustical rating and it would have no effect on the outcome. A standard solid oak door with perimeter seals has an STC rating of 25. As a result, the overall composite wall performance on this example is now only a STC-34. That's the same as a regular 2x4 stud wall with no insulation. An expensive theater just became more expensive to fix. AV RoomService provides full service noise control design recommendations to not only increase the cinema's performance, but to assure every aspect of you client's noise control concerns are addressed early in the deign stages...not later. What is room modeling and why is it important to sound quality you ask? A/V RoomService provides modeling for door & window systems, projector silencers, fabrics, risers, etc. but in this edition we'll cover; room dimensions, speaker/listener locations, 1st order reflections, screen size & location, reverberation control, HVAC, wall, ceiling and floor systems. This is a huge topic, so we'll only look at each of these in brief to answer what they are and why they're so important. AVRS uses our own proprietary software program to look at five criteria to determine optimum low frequency mode distribution and how they relate to human perception. These dimensions are based on available space, noise control issues and budgetary constraints. The results are linear bass response and knowledge of what and where standing waves will live in the room so that they can be addressed with acoustic treatments. Once the room dimensions have been determined, we use another proprietary software program to determine optimal speaker and listener locations. This program again takes into account room modes for linear bass response, boundary effects for tonal purity and geometry for a large, solid, holographic sound field. Once the room dimensions and speaker/listener locations are known, first order reflections can be calculated for each speaker on each surface. Acoustic treatments will be needed at these locations to absorb or diffuse these reflections that would otherwise distort spatial cues and tonality. After determining the optimum location of the speakers and listeners, it is possible to determine the best location for the screen so that the picture and sound is cohesive. Once this is determined, screen size can be calculated for viewing distance acuity. This information will help determine projector model and screen type. Another AVRS proprietary program is used to plug in the noise reduction co-efficients of all construction materials and furnishings that make up the room. We then start adding needed acoustic treatments for wave acoustics (low frequencies) and ray acoustics (1st order reflections) to see what is needed to control the reverberation window across the audible range to between 0.25 and 0.35. The result is a fast, articulate and natural sounding room. AVRS has a compendium of tens of thousands of noise reduction co-efficients, many of which are exclusively our own, such as; book cases, sofas, perforated screens, etc. We look at reverberation times across the entire audible spectrum. Typically a single reverberation time is given for a room, which is meaningless. 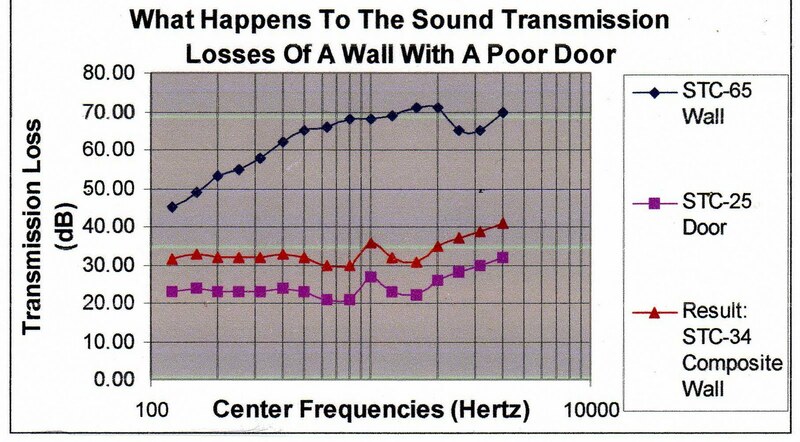 We find most rooms that have been acoustically treated without engineering to be too dead in the mid and upper frequencies and too live in the low frequencies. Such rooms are usually over treated with a single type of treatment that absorbs mid and high frequencies only. The Frequency Response Panel system (FRP) incorporates seven panels to address specific bandwidths for absorption, reflection and diffusion, is effective down to 63 Hz. and is layout engineered for panel type, location and quantity. The FRP system is the only system to allow such control over such a wide bandwidth. In addition, a stretch fabric system covers the entire treated area, masking any visible hint of acoustic panels in the room. Have you ever been immersed in a movie only to be suddenly pulled back to reality because the HVAC turns on or off? Using proven formulas, AVRS can engineer air exchange volumes, air velocity, air flow rates, duct size & type, number & location of bends, number, size & location of registers, plenum silencers, damper locations, and Btu for an HVAC system designed to be comfortable and silent. In order to experience full dynamics and low level resolution, the shell of the cinema must well isolated from outside noises. In addition, the cinema must not be a noise polluter to those not in it. What a waste it is to invest in a home theater that cannot be used when the kids are in bed. AVRS models shell systems to meet the physical and budgetary constraints while incorporating a proper balance of mass/spring for good isolation and sound quality. Too much or too little mass and the room becomes slow and boomy. Engineered shell systems mean fast and articulate low end, high resolution and wide dynamic response without distractions to or from the outside. I hope that this post has helped you to better understand the importance of room acoustics and its role in the end experience.